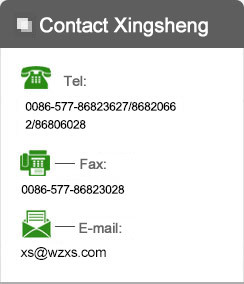 Zhejiang Xingsheng machinery Co., Ltd.(WENZHOU TONGSHENG FLUID TECHNOLOGY CO.,LTD) was established in 1995, mainly engaging in mechanical development, manufacturing and installation in food, chemistry, pharmacy, commodity, chemical industry fields. The enterprise has passed ISO9001:2000 International System Certification. It is observing contract and credit, and it is a quality reliable unit by state certification authority. We're relied on by customers in the demands of safety, reasonability and high quality, depending on lot of experiences and abilities, continuous technical innovation. Our products are made of SUS304, SUS316 and 316L, conforming to sanitary standard stated in GMP specification. We always keeping closely with customers, and do a beautiful job in the similar fields, depending upon perfect quality, advanced technology, perfect service and reasonable product price. Our products are spreading all over China and exported Southeast Asian regions,Australia, so that our products are favored by customers from home and abroad!